Scalgary's sire Glennridge died too young. 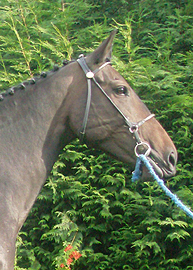 He had a beautiful career as a showjumper and was ready for a bigger as a breeding stallion. 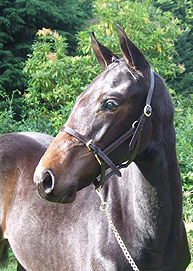 Glennridge was Champion of the VSN, Stallion Test, and Stallion Selection. He was also very successful internationally: 1st Grand Prix Kossen, 4th Grand Prix Geneve, 3rd Grand Prix Munschen, 1st International Stallion Jumping in Den Bosch, 7th World Cup Amsterdam, 4th World Cup Oslo, 2nd World Cup Brussels, etc. His offspring are also successful: VDL Maya received 3rd place in the National Championship for 4 years old jumpers, VDL Nirvana Sub-champion VSN Jumping, Montgommery Champion of the 4 years old jumpers, and reserve-champion of the 6 years old show jumpers of Sweden, Norman placed 3rd in the Championship for 5 years old jumpers in North, Central and South America. 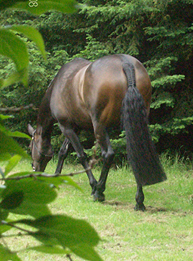 Grand dam is also dam of the Oldenburg-Westf.-Bayern approved stallion Night and Day (sired by Nimmerdor). 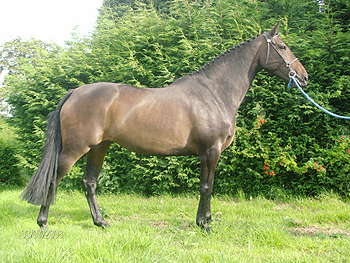 Our broodmare Scalgary enherited the excellent movement and very good jumping abilities from her sire and passes it on to her offspring. Gelding Winsalot (born 2003) jumps very successful 1.20m classes with Laura Tinto.